The way to increase the power and efficiency of magnetic fusion energy may be to risk running the plasma - hotter than 100-million-degrees C - closer than ever to the wall, according to new experimental results achieved by the first U.S.-China fusion research team. The team is led by Dr. Xianzu Gong of ASIPP and Dr. Andrea Garofalo of General Atomics (GA) in San Diego. Using both China's EAST facility and the DIII-D National Fusion Facility, operated by GA for the U.S. Department of Energy, the team has investigated the "high-bootstrap current" scenario, which enhances self-generated ("bootstrap") electrical current to find an optimal tokamak configuration for fusion energy production. Magnetic fusion energy research uses magnetic fields to confine plasma (ionized gas) heated to temperatures hotter than the Sun's core. This enables the ions to fuse and release excess energy that can be turned into electricity, harnessing the Sun's power on Earth. The most developed configuration is the tokamak, and the team's work helps prepare for the 500-megawatt ITER fusion research facility that is currently being built in France by a consortium of 35 nations, including China and the U.S. This joint U.S.-China experiment directly demonstrates the stabilizing effect of reducing the plasma-wall distance in tokamaks with high plasma pressure and large bootstrap current fraction, according to Dr. Gong, who said, "I think, in simple terms, these experiments may provide better physics and operation foundation for ITER plasmas." The focus was on resolving the "kink mode" instability, a wobbling effect that reduces performance, by moving the plasma closer to the vessel's wall, Dr. Garofalo explained . Operating closer to the wall suppresses the kink mode and enables higher pressure inside the tokamak, the toroidal or doughnut-shaped steel-lined fusion device. This gives rise to "pressure-driven" plasma flows that maintain the confinement quality even with lower external injection of velocity. "This is unlike any other regime," said Dr. Garofalo. "It's very risky to move the plasma that close to the wall. The chief operator said 'You can't do that anymore, you're going to damage the machine,' so it was a struggle to prove our theory was correct." The gambit paid off. Moving the plasma closer to the wall removed the kink mode and enabled higher plasma pressure, which, in turn, makes the plasma less dependent on externally injected flow. This is important because in a tokamak reactor, such as ITER, it is very difficult and expensive to drive a rapid plasma flow with external means. 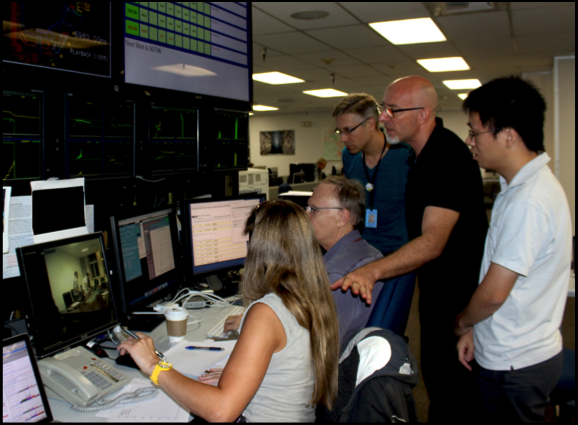 The team performed the most recent bootstrap exploration in DIII-D, following-up work on the record-setting milestone achieved at China's EAST tokamak, where GA scientists have also been collaborating. An ASIPP scientist Dr. Qilong Ren will deliver the invited talk on the topic of Magnetic Confinement-Experiments. While fusion has been in the public domain since the 1950s and its advances have been achieved by teams around the world, this U.S.-China team is setting new milestones in global cooperation. For realization of magnetic fusion energy, global cooperation is needed, said Dr. Gong of ASIPP, who cited the EAST/DIII-D partnership as "an efficient and effective new model" for international science collaborations that benefits both partners and the field of study. "We have made a very good start of international collaboration in fusion research between China and the U.S., and we are very proud to be a pioneer in this field," said Dr. Gong.